Angels herald the Messiah—come to live a life of shame. The Word of God incarnate, well acquainted with our grief. Who alone can take our burdens; look to Him and find relief. Rose in power, death He conquered, now alive forevermore! Till we reign on high in glory with our Bridegroom all our days! 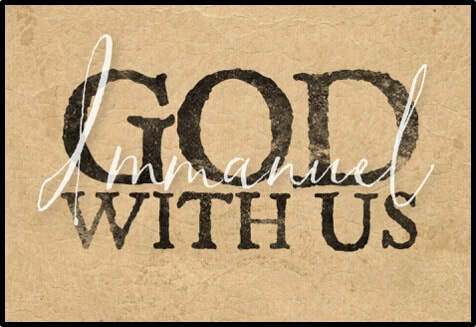 God is with us, God is for us, God within us, Immanuel. in the power of the Spirit glorify the Three in One. There will be no death nor mourning for these words are just and true. He is faithful to His promise and is making all things new! I was looking for a song to end our 2017 Christmas program on Immanuel: God with Us. There were numerous options, but none that hit all of the points I wanted to make. Verse one begins with the allusions to Jesus in the creation accounts of John 1 and Genesis 3, ending with His meager birth celebrated at Christmas. The promised Savior has taken on our flesh. Jesus' role as the suffering servant is the focus of verse two, where we are reminded that although He is with us in our suffering, He has also accomplished eternal victory over our suffering and sin through His death and resurrection. Verse three deals with His active work in our lives as believers. Not only has He taken our sin and given us His perfect righteousness through faith, but He intercedes for us. Our prayers, our worship, indeed, all of our actions are still tainted by sin, but He purifies them all for us before our heavenly Father. said to me, “It is done! I am the Alpha and the Omega, the beginning and the end.